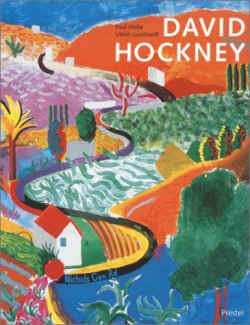 David Hockney (1937- is one of the most important representatives of British Pop Art. 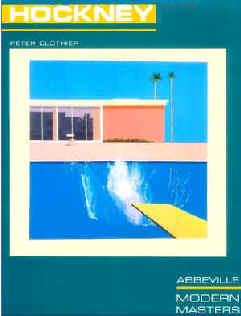 His move to California at the beginning of the 1960s inspired him to paint a number of swimming: pool pictures. In a series of calm, almost static, snapshot-like views, they evoke an effulgent, laid-back atmosphere that, in this example, is disturbed by "a bigger splash The picture, precisely constructed from photographs, is painted in acrylics with bright even areas of color. The splash was added subsequently in impasto. There are no human figures in this uncannily peaceful scene (apart from the swimmer, of course, who is not visible). The landscape, too, is merely a backdrop of secondary importance to a scene of hedonistic leisure culture. 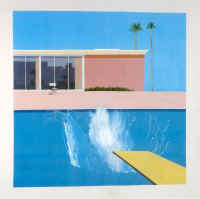 The house and the pool are emblems of the Californian lifestyle; Hockney has made his own. In view of the other pictures in this series, in many of which there is also a male figure bathing, Hockney would seem to have returned to the ancient myth of the Golden Age. The clinically clean atmosphere should not, however, cause one overlook the fact that this is merely a reaction "after the Fall." Hockney's idyllic, sensorly charged leisure world clashes with the profound social upheavals that took place in the 1960s, from which the artist tries in vain to shield himself. Hockney's perfectly staged visual worlds, for which he also used photomontage and collage, fascinated an entire generation of younger artists who preferred a "freely figurative" form of painting to an abstract art that had congealed into ornamentation. 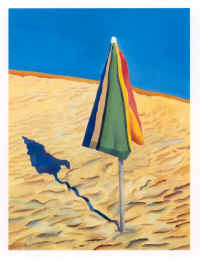 British born Hockney (1937-) was a boy wonder of the British Pop Art before moving to Southern California. As an artist, he continued to evolve - moving from a subdued, introspective style to an "American" style of bright colors and optimistic landscapes. He became particularly enamored with swimming pools and their clarity of color and light. POOL AND STEPS was published by the Museum of Contemporary Art in Humlebaek, Denmark for an exhibition at the Louisiana museum of modern art. 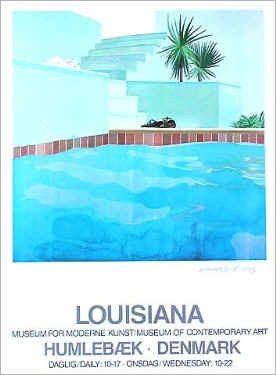 Hockney's original painting was done in 1971, but I do not have a date for the poster. Overall paper size is 33 1/2" by 24 1/2". San Francisco; 1994; First Edition Hardcover; NEW with DustJacket; large folio at 12 x 15 inches. 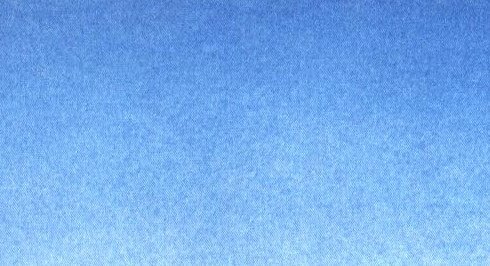 The Califfornian blue is deflinitely inspired by Hockney where as the the estranged figures on the terrace cire in reference to Hopper. Loustal, Arrière saison, page 17, detail (mixed media), © Albin Michel, 1985. 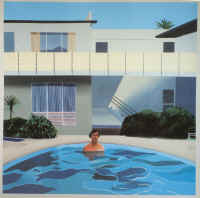 Ce bleu califormien vient tout droit de chez Hockney, mais le personnage solitaire sur la terrasse appartient plutôt à Hopper. 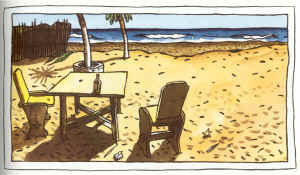 Loustal, Arrière saison page 17, fragment (technique mixte),© Albin Michel, 1985. Lives in London and the U.S.A. 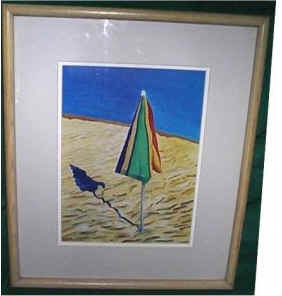 This bright and colorful print is BEACH UMBRELLA by British artist DAVID HOCKNEY (1937. This still evolving and talented artist has been called the "most famous living artist" of the present day. Or as another art critic refers to him, this "World Famous Royal Acadamician"... It's time for a change of decor making this print, the acrylic original of which was done in about 1970, available for a new wall. Nicely double matted and framed in a 15 1/2 x 18 1/2 inch light Oak wooden frame, both print and frame are in very good condition with no stains or fading. The window of the inner mat is 8 1/2 x 11 1/2 inches. The artist has made the shadows and ripples in the sands and the lines of the cabana umbrella and its shadow into a classic composition so pleasing to behold. The original about this print is mounted on the backing packing.